If you’re new to recording, or if you haven’t recorded an acoustic guitar before, then check out these tips for recording acoustic guitar below to ensure that you have a successful time recording. These tips are meant for those that have not done any or much recording before and aren’t intended as tips for professionals. Experiment with this before you begin recording if you have time. The type and gauge of strings you use will make a big difference to the tone of your guitar. If you’re looking for a really nice sound and looking for a particular sound, then you shouldn’t underestimate the impact of the strings you are using. When experimenting with gauges of strings, keep in mind that you (or the guitarist you are recording) still want to be able to play everything accurately. If moving to heavier gauge strings means that you don’t play what you want to play as well – and you can’t adjust in time before the recording begins, then you might need to compromise between playability and sound (assuming you preferred the sound of the heavier gauge strings). 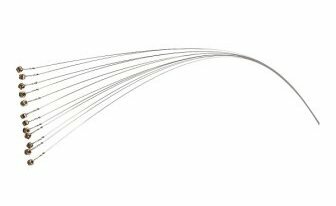 Typically heavier gauge strings will have a fuller sound and lighter strings will have a thinner sound. In terms of materials you’ll need to experiment to see which suits your sound and playing the best. Check out the link below for more on choosing acoustic guitar strings. An out of tune recording is no good. Tune with an electronic tuner. 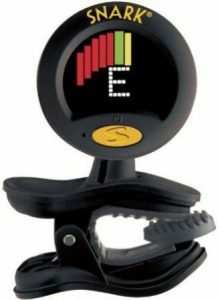 Even if you are great at tuning by ear, make sure you have the tuning spot on by using an electronic tuner – this also takes less mental energy – so you can focus your energy on playing the best you can on the recording. It may sound like a lot of effort to make sure you’re in tune after every take but trust me, it’s less effort and less frustrating than having to redo an otherwise perfectly played take because you weren’t in tune. This may sound over the top but what you wear should also be considered. If you have something metallic or loose hanging off a shirt or a belt buckle that you keep hitting into the guitar this will come through on the recording. You may not notice these sounds when you are just jamming on your guitar. But you will notice them in a recording. What you go with will depend on a number of things, for example. If you are recording live – with other instruments being recorded at the same time, then using a direct line out of your amp or plugging in directly with your guitar is likely the best way to go. If you use an external microphone, then it will pick up noise from other instruments, which will make it harder to mix later on. There are some things that can be fixed in the mix, but you want to try to get the best possible sound to begin with – it just makes life so much easier. If you are recording using an external microphone (a great option if you want to really capture the sound of the instrument as it is) then you might want to experiment with microphones to see which you prefer. If you are hiring a studio, then there might be options for you to try. Otherwise, the amount that you can experiment will depend on your budget and the availability of microphones you can try. The sound you create from one pick to the next can be drastically different. So try out different picks for the same part of a song and see what you prefer the sound of when recording. For recording purposes it may be different to the pick you like playing live or at band practice. If you are recording more than one guitar part, then you might be using different picks for different parts. If you are recording with an external mic then the room that you play in will make a big difference to the sound you get. Play in a room with too much dampening and your guitar might sound dull. Play in a room with too much echo and you are likely to get a washy sound. Experiment with rooms in your house (if you are recording at home) and also try bringing in wooden furniture into the room or even just a nice big slab of wood. This could make a big difference to the tone that you get. The best place to start is by pointing the microphone at the fingerboard where the body of the guitar joins to the neck. In terms of distance, start out with your microphone around 15” away from your guitar. Then experiment from there to find the sound you like the most. Move the mic so that’s pointing more towards the soundhole – this will likely give you a fuller, warmer sound. Move the mic towards the neck more – this will likely give you a less bassey, more treble-heavy sound. Try moving the mic slightly further away – this should give a more ambient sound. Experimenting with mic position will have a big effect on the sound you get. If you’re final recording is going to consist of just your guitar, then you don’t need to worry about this. But if there is going to be anything else in there at all, then see how your guitar sounds with those other parts. Even if it’s just guitar and voice. See how the sound that you’re getting goes with the voice. You might have come up with the sound that you think is perfect and do take after take until you are finally get something you’re finally happy with, and then you go to add some other instruments or vocals – and you find that, this guitar sound just isn’t going to work – that can be very frustrating! So before you settle on a sound, make sure you try it out with other instruments that will be used in the recording fist. There are obviously a million more tips that could be provided for recording an acoustic guitar, but hopefully these will help you to get the sound that you want. Just quickly let’s also discuss the purpose of your recording and how these tips will and won’t apply. 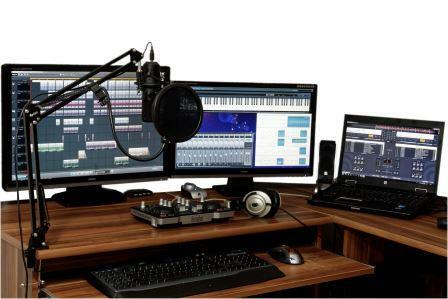 There could be many reasons that you want to record including recording for improvement, recording an album or recording a demo for band mates, recording a demo for an audition or recording a demo to get gigs. If you are just recording in order to track your improvement on guitar (something that I highly recommend that you do) then you won’t have to worry too much about many of these tips. You aren’t looking for a professional sounding recording – just something decent enough that you can hear what you are playing and what you need to improve and so that you can compare it when you record something else down the road. That said, you still want a clear sound. But you won’t need to experiment with finding the perfect sound for what you are playing. And you don’t need to go to the trouble of changing strings and the likes. You will definitely want to tune though. If you’re recording a demo – whether it be to secure gigs, for an audition or to attract interest from record labels, you’ll want to have something of a decent quality – so following the tips above will help you to come up with a better quality recording. If you’re recording an album, then hopefully you have someone you are working with that can help you to get the best sound possible. You can still take the tips above into consideration. But this post is a long way from being everything you need to know! A long way! You could fill a room full of books on the subject of recording an acoustic guitar. But I hope this has helped those who are new to recording with an acoustic guitar. Any questions or comments very welcome in the comments section below. Your post offers some great tips on recording with an acoustic guitar. I agree completely with respect to the strings can make all the difference. You suggested in the post to record from the mic on the guitar’s sound hole. I was wondering if it is ever a good idea to record from an acoustic amplifier as this may give you a fuller sound? I am not a sound engineer and haven’t actually tried it, but am interested to know if you have. Yeah you can definitely record from your amp (see tip#4). You can do this either by using the direct line form your amp or by micing up your amp. I’m not a sound engineer either – but I have done a bit of recording with acoustic guitars. I wouldn’t say you necessarily get a fuller sound from your amp – the advantage of recording from your amp is that you can record with any effects etc that your amp might have if that’s what you want to do. The other advantage of recording through your amp (if you use the direct line) is that you don’t have to worry about setting up the room, you don’t have to worry about getting a mic, you don’t have to worry about background noise (or noise from others in your household if you are recording at home) etc. I think recording through an amp (using the direct line) is probably the easiest most convenient way – well that and plugging your guitar straight into your recording device. But in my experience you can get a better sound using a mic and aiming it at your guitar. It requires more effort and knowledge and trial and error to get it right but you get a better sound overall if you do it well (IMHO). So if you are looking to get a really good sound then I think this is the way to go. But if you are looking for a quick, easy recording then plugging your guitar in direct or using the direct line from your amp are the best ways to go. 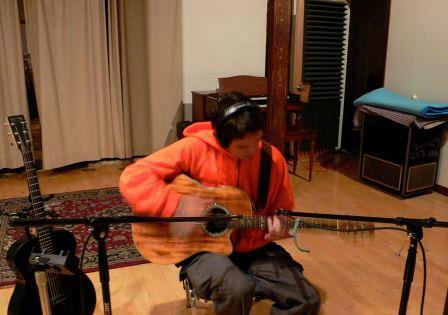 It sounds like there is quite a bit to recording an acoustic well, from the type of room, to the clothing you wear and the pick you use. I guess it can be a bit of trial and error until you get it just right. I never really thought about the types of strings being used would affect the recording of an acoustic guitar, but it does make sense. Yeah there’s definitely heaps to think about when recording an acoustic guitar – or recording any acoustic instrument for that matter. The clothes you wear is a little bit pedantic of me 🙂 That one is the least important by a fair distance. Yeah trial and error to an extent for sure. But knowing a few things can speed up the trial and error process. If you don’t have a few theories and guidelines then using strictly trial and error could take forever. But you definitely need it to an extent because every room will sound different – and every guitar is unique and the best set up for that particular guitar might be just ever so slightly different to get the best sound. Also, I find for trial and error the best way to do it is to go from extreme to extreme and then working your way in. For example, try setting up a mic 2 feet away, test the sound and then set it at 1 inch away and see what you like the most. If you like the 2 feet away better, then try it 1 foot away (in the middle of the other 2. If you still liked 2 feet away better than 1 foot, then try 18 inches and so on. Strings will definitely make a big difference to your sound. If you have them available, then trying different guitars for the same song is a great idea too. It might be that that particular song suits a certain guitar’s sound – either because of the tonewoods of that guitar or the body size/shape (those are the 2 main ones anyway).